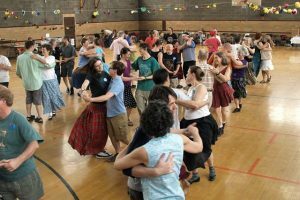 Our Contra Dances happen every 2nd Friday of the month except July and August at the Smithtown Historical Society’s Brush Barn. Tired of the isolated individualism of modern social dancing? Reenter a world of called communal movement that has roots in Colonial America. Live fiddle music belts out foot stomping jigs and reels while the caller instructs and calls out various dance moves done together in lines- swing your partner, allemande your neighbor, ladies chain, etc. Since it’s communal, you can come as an individual or as a couple. Admission $10 LITMA members / $14 non-members / $7 students / under 16 free with parent.